Anyone who manages a business blog knows all too well that the darn things require quite a bit of commitment. The bright side is, they can also be extremely rewarding from a return-on-investment perspective. But how do you know if all that commitment is actually leading to a positive ROI? Analytics, my friends. Analytics. As someone who pulls together the monthly report for this very blog, I thought I'd share the metrics I track on a monthly basis (and for certain metrics, much more frequently) to report on the progress and success of our blogging efforts. In other words, how many visits does your blog rake in in a given period of time? Tracking this on a monthly basis will give you a good sense of whether you're growing traffic to your blog over time and insight into monthly trends. For example, is January typically a strong month for your blog? Are there certain months in which your blog's performance is particularly sub-par? Picking up on these trends allows you to plan your strategy differently for months you know are known to be challenging. 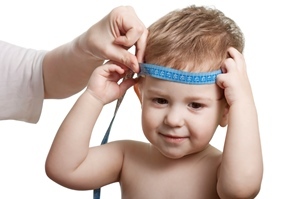 HubSpot customers can easily track this metric using the Sources tool (pictured below). Google Analytics is another option for non-HubSpot users. Where is the traffic to your blog coming from? Social media? Organic search? Referrals? Of those sources, which social networks, keywords, and websites are sending visitors your way? Knowing how your blog visits break down can give you insight into your high-performing channels as well as under-utilized ones. Where is your biggest opportunity for growth? Could your blog subscriber emails use some optimization to drive more traffic to your blog? Are you neglecting your blog's SEO? This information is also accessible via the HubSpot Sources report or Google Analytics. Of your overall blog visits, how many can be attributed to the homepage of your blog? Knowing this will give you a sense of whether your visitors use your blog as a destination site (i.e. direct traffic is a big driver of your visits, and visitors typically enter your blog's URL into their browser to get to you) vs. one that gets found through indirect sources. This will also give you a sense of the type of visitors you typically attract. For example, a lot of direct traffic is an indication of repeat visitors, whereas more traffic from indirect sources usually indicates a higher proportion of new visitors. Furthermore, if you notice that your homepage is generating a lot of your traffic, you might want to diagnose the efficiency of that homepage. Is it optimized for lead gen? What pieces of low-hanging marketing fruit is it missing? In HubSpot, customers can track this metric via the Page Performance tool (see below). Google Analytics is again an option for non-HubSpot users. Tracking the sheer number of blog posts published in a given time period is easy -- and great for identifying correlations between blogging volume/frequency and other results like traffic and leads. Our benchmarking data shows that blogging more leads to more traffic and leads, but what about for your blog in particular? This metric is easy to count manually, but an export of HubSpot's Page Performance report can provide this data (along with the next four metrics) easily, too. Which posts are you real traffic drivers? Identifying these posts can help you analyze the topics, types, and formats of blog posts that are your bread and butter for raw visits. Having a traffic problem? Now you'll know which types of posts to create to solve it! HubSpot's Page Performance tool is your go-to for this metric. Just sort by views in the user interface or in the Excel export. Google Analytics can also help here as well. This metric is good for understanding how each individual blog post contributes to overall traffic. It's also a great metric for understanding the correlation between volume/frequency and results. If you're publishing more, but your posts' average views go down, this means each individual post you publish is getting fewer views. This could be an indication that you're sacrificing quality for the sake of quantity -- and generating the same results. Could you generate the same results with fewer, but higher quality posts that lead to a higher quality blog overall? A similar metric to look at here is median views -- which is great when you have one or two over- or under-performing posts that might skew your averages. Again, the Page Performance tool, exported and analyzed is your best friend for this one if you're a HubSpot customer. Non-HubSpot users can fall back on Google Analytics. Are you creating content worth linking to? Inbound links are extremely valuable currency in the land of search engines. It indicates to search engines that your content is valuable to others and worth ranking well in search results. Keep track of your average inbound links so you can keep tabs on the quality of your content (more important than ever in the eyes of Google) and thus, your inbound links' impact on your search authority. 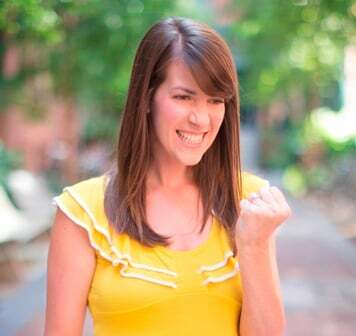 And the winner is ... HubSpot's Page Performance! Not a customer? Google can help you out in your Google Webmaster account. Although many consider the number of comments to be mainly a vanity metric, tracking engagement and sentiment among your readers definitely has its place. Use this to gauge your audience's reaction to your content and how involved your community is. If engagement is low, experiment with ways to encourage it: Pose questions in your content, try new types of content that might elicit a response, and get involved in the discussion in the comments of your posts as well. When your readers feel more engaged with your content, they'll be more likely to come back in the future, share your posts with others, and help you expand your reach. HubSpot customers can get this from, you guessed it -- Page Performance! Otherwise, you'll need to rely on your individual blogging platform's analytics for this data. While also somewhat of a vanity metric, number of social shares per post will give you a good sense of which types of content perform well in social media -- and in which social networks in particular. This can inform decisions about which types of content to promote in social (and on what networks specifically) for the best ROI. You might find that content that performs well on Twitter, for instance, does very poorly in a social network like LinkedIn. Use these insights to improve your social media marketing strategy as it relates to blog promotion. Track your posts' overall social shares -- as well as a breakdown of the top four social networks -- using LinkTally.com, a free tool created by HubSpot's social media scientist, Dan Zarrella. Traffic is all well and good, but leads (and customers!) are a much better indicator of your blog's impact on your business' bottom line. Track how well your blog is contributing to lead and customer generation over time. In doing so, you'll be able to identify correlations between variables such as content volume, frequency, etc. and lead/customer generation effectiveness. You'll also be able to diagnose inefficiencies in your lead gen strategy. Is your truly blog optimized for lead gen? To measure leads and customers from your blog, you'll need software with closed-loop reporting capabilities. 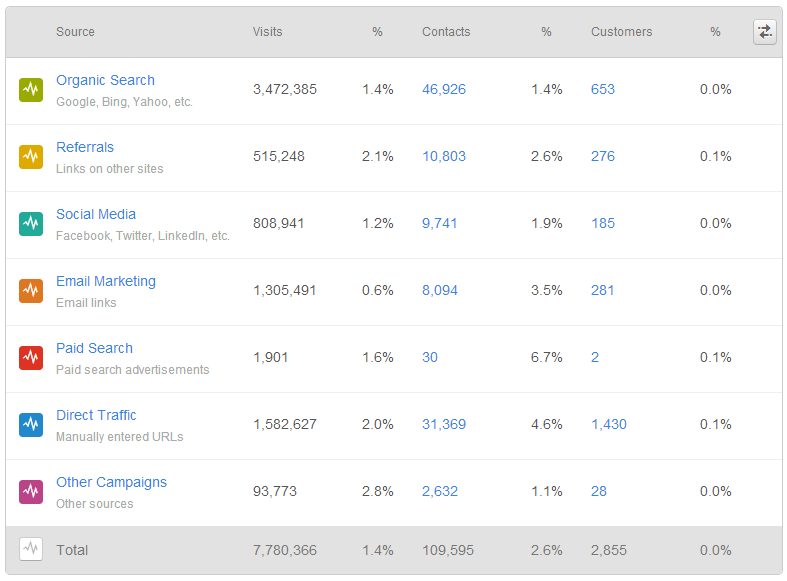 HubSpot users, for example, can measure new contacts and customers generated by their blog via the Sources report for their landing pages (look at referrals, then your blog's subdomain), or, for Enterprise customers, by creating a custom Contacts report (see below) to track this data. Take it one step further by identifying the sources your blog leads are coming from. Do you generate more blog leads from email than social media? Pair this with your traffic source data for even meatier insight: For instance, if you notice social media isn't a great source of blog leads but is one of the top traffic sources for your blog, you might want to focus on finding ways to fix that discrepancy so you can generate more leads from all that social media traffic. 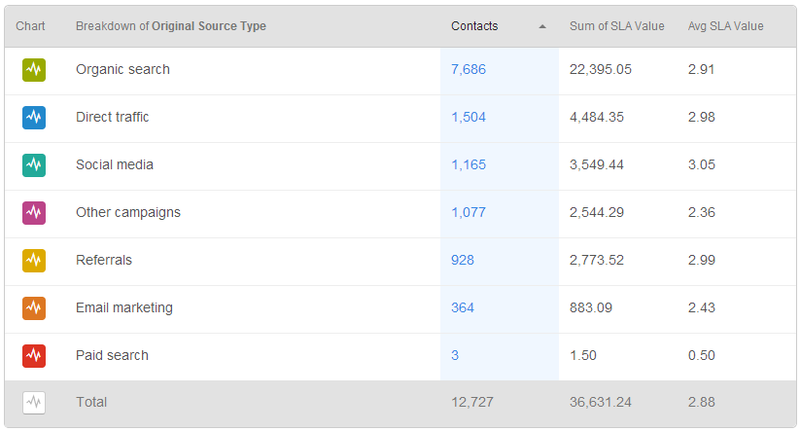 In HubSpot, Enterprise users can see this lead source breakdown via a custom Contacts report. And if you really want to improve your blog's lead (or customer) gen potential, you need to dig into the data even deeper. 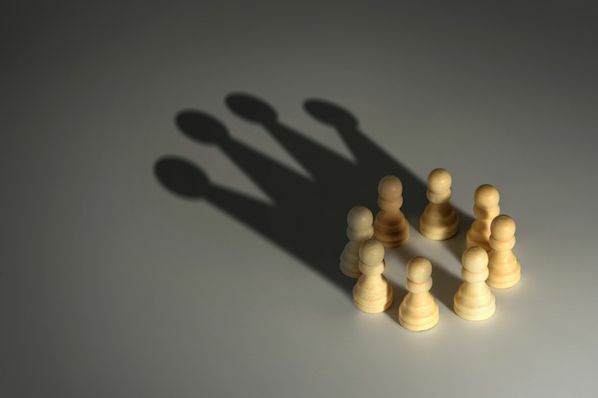 One great way to do this is by analyzing your individual posts' lead gen effectiveness. A report that breaks down your blog's lead gen by post will give you a sense of the types of content that are great for generating leads. Does the topic matter? What about the format? This way, you can learn which types of posts are your true lead drivers and have that insight handy whenever you're behind on your leads goals. Same goes for generating customers! Again, HubSpot customers can use the Sources report for their landing pages and dig one level deeper to see new contacts/customer counts for each individual post. Furthermore, Enterprise customers can create a custom Contacts report broken for blog leads broken down by first page seen to gather this data. Calculate your conversion rates (visit-to-lead and lead-to-customer) to understand the relationship between traffic, leads, and customers. This can help you pinpoint what you should be focusing on when making improvements to your blog. If you improve your visit-to-lead conversion rate for example, you can generate even more leads from the same amount of traffic. On the other hand, you could also increase lead/customer generation by increasing traffic and keeping your conversion rates steady. Track this over time to understand how changes to your blogging strategy and tactics are affecting your ability to convert visitors and leads. Here's a handy online calculator for calculating conversion rates. If you're a HubSpot customer, we'll do you one better -- the Sources tool calculates conversion rates for you automatically! How many people are subscribed to your blog via RSS? More importantly, how many of those subscribers actively check your feed? The number of active subscribers you have is a great metric for evaluating how many loyal, dedicated readers you've attracted and retained. It's also a great indicator of your blog's stickiness. Do people just visit your blog once, never to return? Or do they love your content so much they want to keep coming back for more? 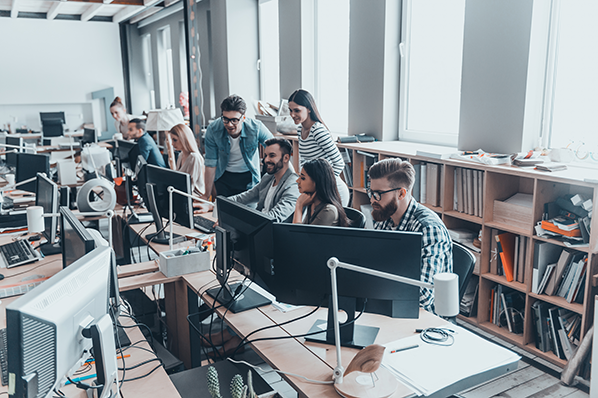 Generating more and more of the latter type of visitor means you're growing a group of content evangelists who are more likely to share your content, sing your praises, and expand your reach to more potential readers. For HubSpot customers, RSS subscribers can be accessed via Page Performance. Keep in mind that HubSpot's reporting gives you the number of active subscribers who have accessed your blog's feed in the last day -- weeding out inactive subscribers who may have added your feed to their RSS reader once but never checked it later and giving you a more accurate report on your RSS subscribers. It also provides a quick look at how this number has changed over time. If you're not a HubSpot customer, check your RSS feed account for more information about how your subscriber count is calculated. Last, but definitely not least, we have another breed of subscribers -- your email subscribers. Email subscribers have all of the same benefits of RSS subscribers and more, since these subscribers have given you access to their precious inboxes. As a result, there's a direct correlation between the number of email subscribers you have and the amount of email traffic you generate to your blog. If you haven't put a lot of effort into generating email subscribers, you're sitting on a gold mine of opportunity, my friends. Get started with these tips for converting casual visitors into dedicated subscribers. Then beef up your blog subscriber emails so you're getting the most out of them with these best practices. HubSpot customers can track their email subscriber metrics in the same place as their RSS subscribers. Non-HubSpot customers will need to rely on their individual subscriber email platform for this data. What other blog metrics do you track on a regular basis?